Ahead of Britain’s referendum on its European Union membership on Thursday, the large majority of debate surrounding a potential vote to leave, also known as a Brexit, has focused on the economic impacts that could befall the UK and the rest of the world. Doom-laden predictions of recessions, crashes in the value of sterling, and tumbling stocks have taken centre stage, with everybody from Bank of England governor Mark Carney, to the IMF, to Goldman Sachs entering the fray. However there is one area where that has been relatively little discussed — the political issues in Europe that Brexit could end up causing. 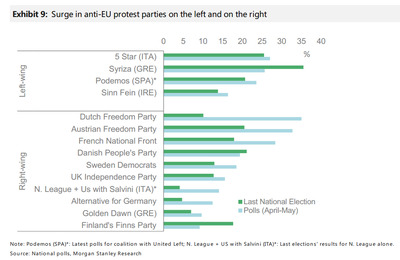 In a new note, Morgan Stanley touches on one of the least covered potential impacts of a British vote to leave the EU — the fact that it could help trigger widespread and significant political change across Europe. The analysts go on to point out that elections are also coming up within the next year or so in the Netherlands, France, and Germany, while Italy is holding a referendum on a crucial change to its constitution later in the year. In all four countries, populist, protest parties are making substantial headway, and could gain even more support if Britain votes to leave, the bank argues. In the Netherlands, Geert Wilders right-wing Dutch Freedom Party is growing its popularity. The National Front’s Marine le Pen is expected to reach at least the second round of the presidential elections in France, and Germany’s Alternative for Germany party is also gaining ground. On the left of the political spectrum, Italy’s 5 Star party just made a huge breakthrough, with female candidate Virginia Raggi winning the Rome mayoral election, and becoming the city’s first female mayor. Whichever way Britain votes on Thursday, the political shift the referendum triggers could be massive.